The year 2003 was one of many blessings as it entailed the birth of the Revival Pentecostal Church in Phoenix, in Cape Town. Through God’s grace, the church has planted three other branches in Upington (South Africa), D’uvira which is in Congo and in Burundi. 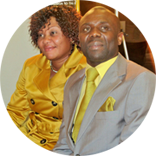 The branches are growing successfully under the leadership of Pastor John Boanerge (Upington) and Pastor Toto Musafiri (Congo, Uvira).